Suppose you have a meek, mild-mannered transformer that wants to be something greater... something powerful... something that inspires awe and fear! How do you take it apart? 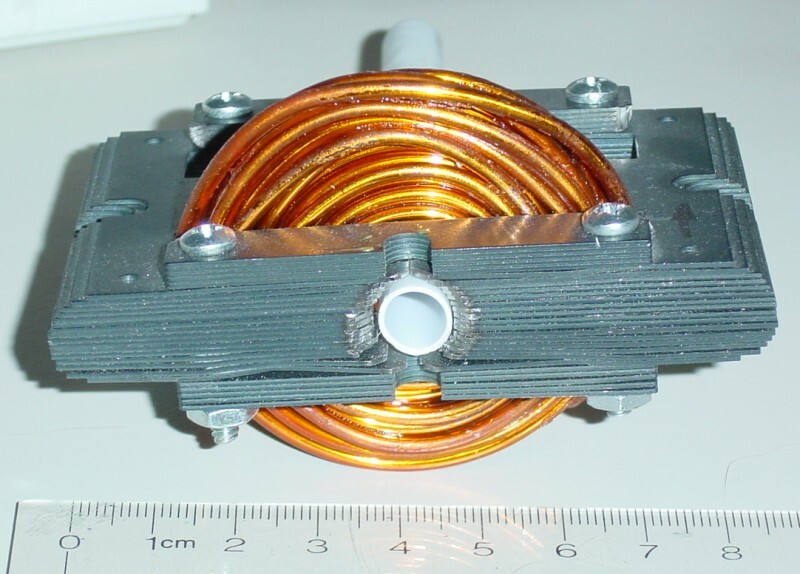 How do you re-use laminations for a coilgun? 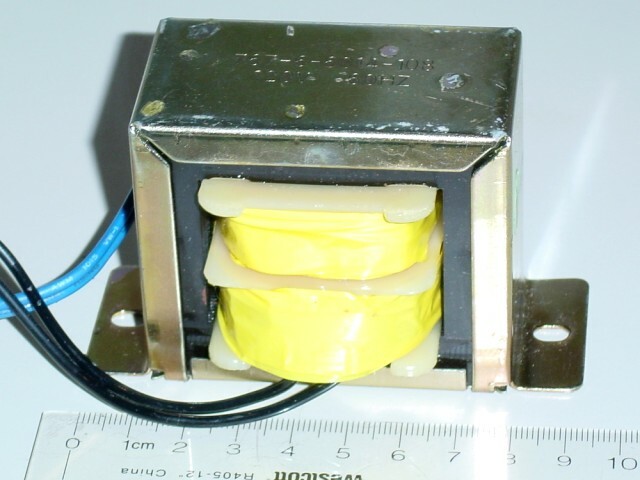 Modern transformers are built from a stack of E-shaped laminated iron, spot-welded together. 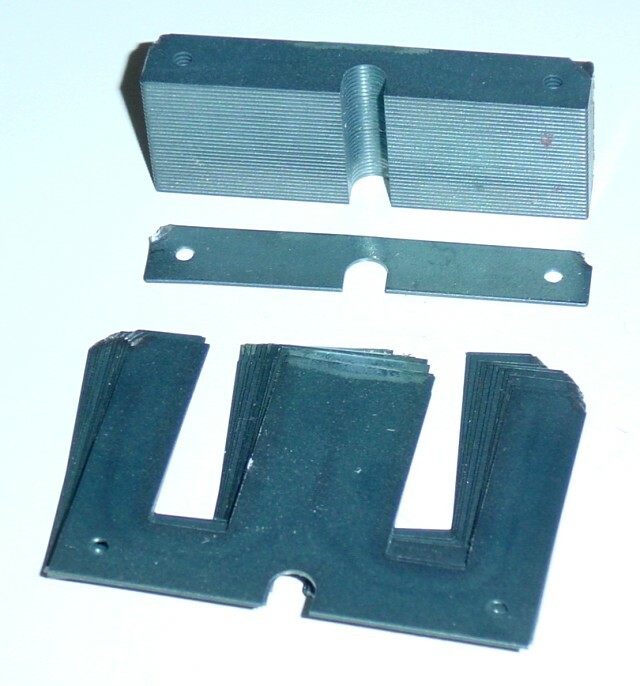 Usually an external bracket provides a vibration-free mounting point. The wire coils are preformed on plastic bobbins and slid onto the center bar of the E-core. 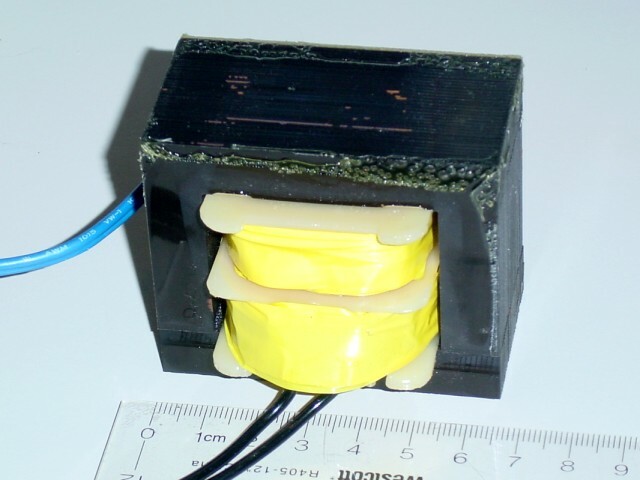 These transformers are reliable and inexpensive. The shiny external bracket must be removed to expose the core. For this transformer, a large screwdriver bent the tabs that held the bracket in place. Like most small devices like this, the bracket was also glued on (to eliminate 60 Hz hum). The laminations must be separated and removed. I used a sturdy hunting knife to begin prying them slightly apart. A hand-held Dremel power tool can grind through the welds and separate the leaves. When you're done (about two hours later) your transformer core should be merely a neat stack of laminations. It won't inspire much fear yet, but that's coming! The wire coils can be discarded. I can't think of any use for bent copper that is epoxied together. Note that this iron is very soft. To drill holes, you must firmly support the bottom leaves to avoid warping. For example, you should clamp a stack to a hardwood before drilling. The goal is to surround the firing tube with high permeability iron. I took two stacks of E-core laminations and turned them face each other. They were squeezed tight against a white plastic firing tube, and stacked to the same height as the tube's diameter. The flat laminated end pieces were laid across the top, and the whole assembly bolted together. Click on this picture for a close-up view.